Celebrity Baby Blog Beyonce Gift Bag on www.celebritybabyblog.com! Wish you could splurge on yourself and your tot like new mom Beyoncé Knowles? 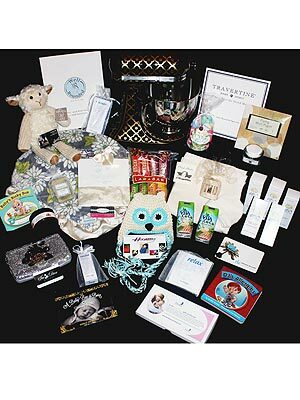 Lucky for you, Hollywood Baskets is giving away a gift bag chock full of luxe treats for both mom and baby to one Moms & Babies reader. Hurry up and enter for your chance to win! Online entries must be received between 12:01 a.m. Eastern Time (“ET”) on 1/9/12 and 11:59 p.m. (ET) on 1/15/12. See Official Rules.